The day has arrived, presents are all unwrapped & bellies are full. We are all having a rest until the family arrive for Christmas dinner & I thought I would share with you my Christmas card I sent out to many of my friends. There are two versions of the same design because you only get one sheet of each of that gorgeous silver foil DSP in the pack. I wish you got 2 of each don't you! 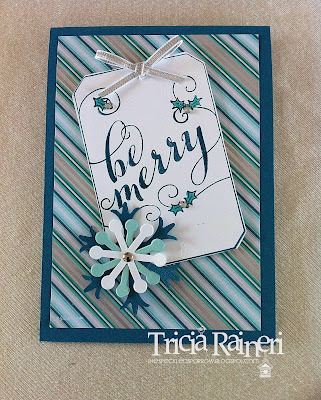 I have used the very versatile single stamp called Be Merry & for only $16 it is a great stamp to use on both cards & for your Christmas tags. I masked off the to & from on the stamp to get this effect. 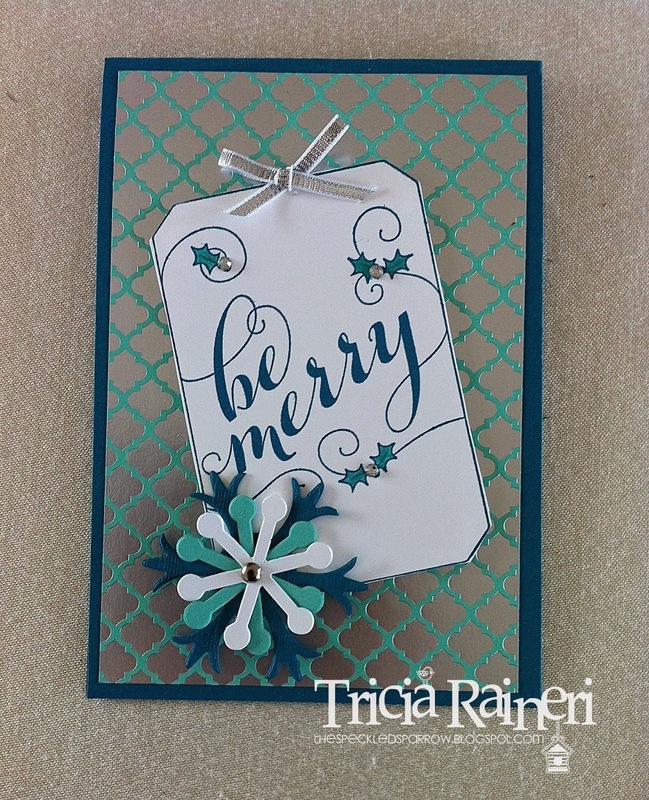 I used the retired Bigz die for the snowflake & Island Indigo as my base colour. These single stamps have been so handy for my Christmas preparation for cards & gifts & I even gave some of the actual stamps as gifts. Paper: Island Indigo (124390), Coastal Cabana (131302), Bermuda Bay (131286), Winter Frost Specialty DSP (132341). 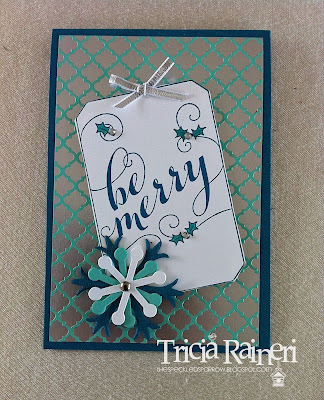 Cool Tools: Bigshot (113439), Snow Flurry Bigz Die (Retired), 1/8" Mini Silver brads (122941), Basic Rhinestones (119246), SIlver 1/8" Ribbon (132137). I have thrown in a double whammy this week as I know you are all busy preparing for Christmas. It is only 6 days away (eek! ), so I figured you might need some more ideas. I have a lot of teachers & family friends to buy for at Christmas & often find they get lumped into the chocolates or biscuit category. This year I decided to spruce up their gifts with some little apothecary jars filled with chocolates. I even made a coordinating card. I made 5 of each colour scheme & liked both, but did prefer the Crumb Cake version. Which colour do you like best? 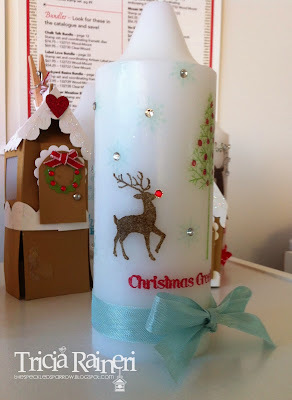 I have just entered these little last minute gifts in the SUO only challenges #86 - Its Almost The Last Minute Challenge! 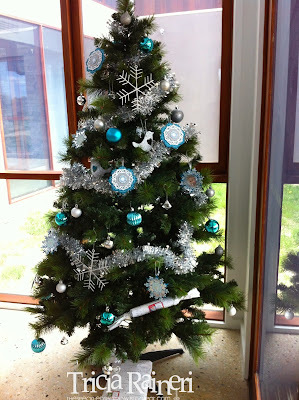 Why not pop on over & check out the other entries. The first one uses Crumb Cake & Cherry Cobbler with the Season Of Style Paper Stack. The second is my Pool Party version. 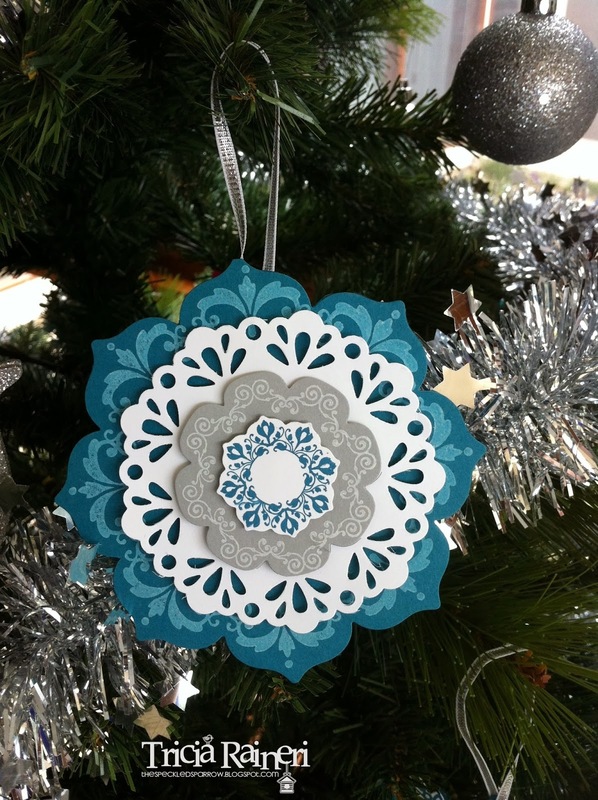 This one has white embossing onto Pool Party with Smokey Slate & uses the Winter Frost Paper Stack. 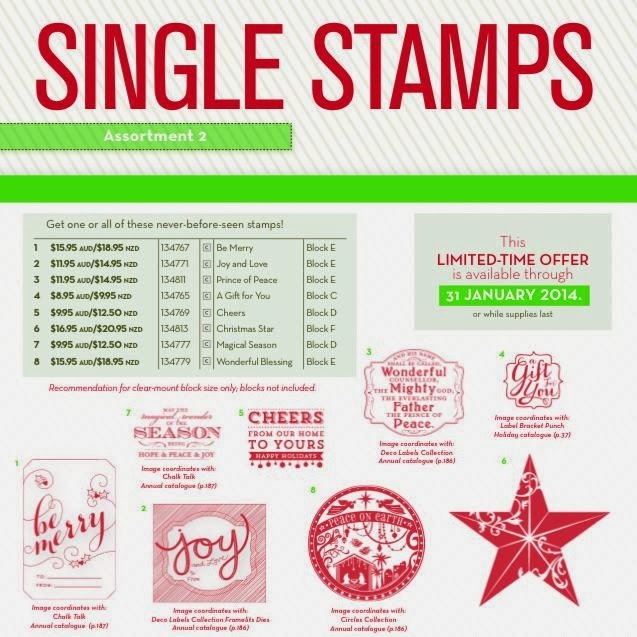 Stamp Set: Festive Flurry (131778), Merry Little Christmas (131829). 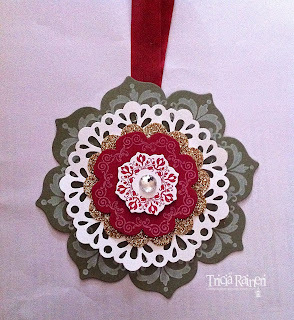 In Week 7 I made this card in a Cherry Cobbler version, but had always intended to make this version. It was just that I was distracted by the Season Of style DSP & totally forgot to make it. 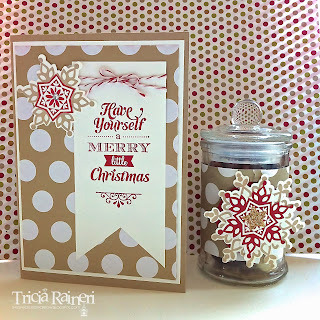 When I first saw the Joyful Christmas stamp set this was exactly what I had in mind. I think I prefer this version. How about you? I love that the vellum really shows off on this version & the pure white & gold gives this card a much more elegant look. 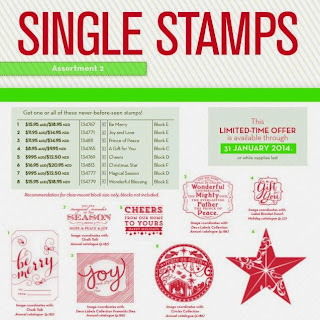 Stamp Set: Joyful Christmas (131805). Paper: Whisper White (106549), Pear Pizazz (131290) Gold Foil Sheets (132622), Vellum Cardstock (106584). 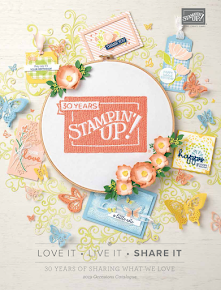 Cool Tools: Big Shot, Gold Embossing Powder (109129), Pearls (119247), Petals A Plenty embossing folder (116824), Expression Thinlit Dies (132171), Dimensionals(104430). 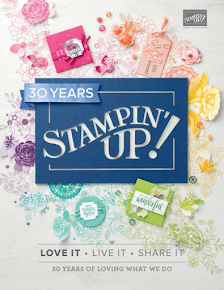 Every Year around this time of the year Stampin' Up! bring back a whole lot of retired product in their Clearance Blitz Sale. This means you can grab some retired products at up to 80% off! These items are WHILE STOCKS LAST!! (yes, I am yelling as these sell out really fast!) so if there is anything you want you had better be quick as they sell out in a matter of hours. My tip for you is join my online store & set up a profile, then get in there & order your items before they are all gone. That way you won't miss out & they will be shipped direct to you. Why not do some Christmas shopping at a huge discount. If you don't have an online account & don't wish to, please do email me your items & I will see what I can do, but I can't promise I will be able to get all your wish list. This Clearance Rack will be ongoing so extras will be added as things sell out, so it might pay to visit daily or at least weekly. I have just visited my online store & bagged myself some nice little bargains in the Clearance Rack Sale. 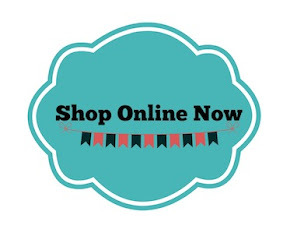 See that box to the right that says MY online Store "shop now". Well...if you click there it will take you to a super sale where lots of great retired products are up to 80%off!!! You can get there by clicking HERE too. Oops I forgot to post this card last week in all the rush. 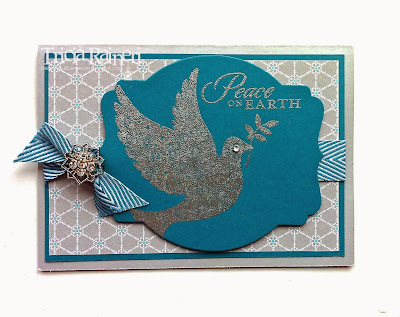 Those of you that get my newsletter will recognise this card as it is featured there. I love using Island Indigo at the moment. One look at my Christmas tree will tell you that! 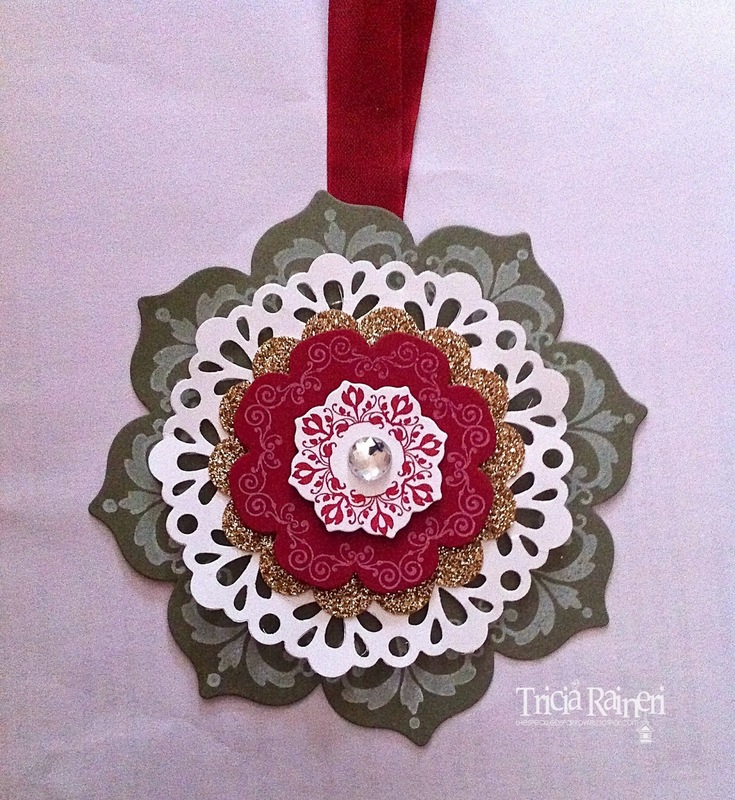 We made this card in one of my Christmas card classes a month or two back & I really liked how it turned out. I have used Smokey Slate as the base & silver embossing powder for the dove. The Winter Frost Specialty DSP was used as contrasting background. I will be sad to see this DSP go as it is one of my favourites. Paper: Island Indigo (124390), Smokey Slate (131291), Winter Frost Specialty DSP (132341). 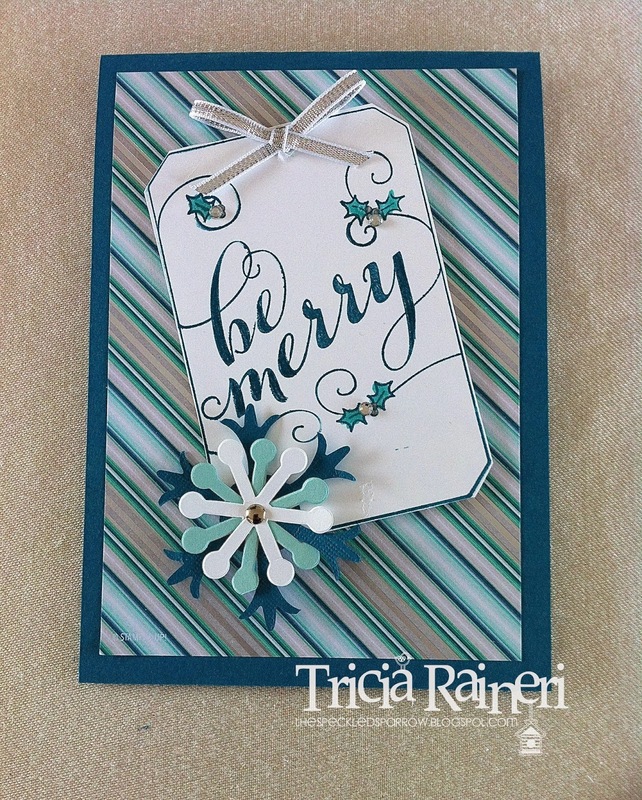 Cool Tools: Bigshot (113439), Magnetic Platform (130658), Deco Labels Collection Framelits (130102), Silver Embossing Powder (109131), Frosted Finishes Embellishments (132150), Island Indigo 3/4" Chevron Ribbon (131151), Basic Rhinestones (119246). Here is a sample of one I made earlier. I used Santa's List & More Merry Messages. The last one is made using the cute hostess set called Warmth & Wonder. Cool Tools: Heat Tool (129056), Real Red Ribbon (126875), Pool Party Seam Binding Ribbon (125582).